Does The Avengers live up to the hype? Click the jump to find out! 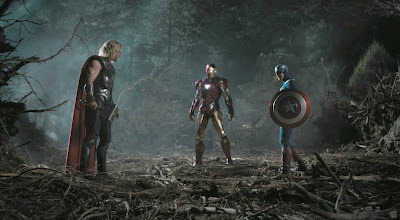 The comic book fan-gasm known as The Avengers has finally arrived, with all the hype surrounding a summer blockbuster. For some, the idea of the ultimate superhero get-together promises to be bigger than anything we've ever seen. Yet, it also comes with its own set of questions: Would Director Joss Whedon (Firefly, The Cabin in the Woods) keep consistency between characters originally envisioned by other directors? Is there enough time for each hero to have their moment without making another Lord of the Rings: Extended Edition? What about the third actor playing Hulk in as many films? And while those and other questions have nagged at every fan since the project was announced, we really had nothing to fear. The Avengers is a film of epic proportions, exceeding every expectation I had, putting to rest every question and concern I raised, and proving itself as the greatest superhero movie ever. But be warned: if you have not seen the single-hero movies preceding The Avengers, you might get quickly confused; and we wouldn't want you going all Green Rage Monster on us. Then again, if you watch us frequently, then you probably have three copies of every film, like some of us who can't stop from triple-dipping. When The Tesseract is stolen by Thor's half-brother Loki (Tom Hiddleston, War Horse), who intends to use it as a gateway for an alien invasion of Earth, Nick Fury (Samuel L. Jackson, Jackie Brown) assembles a team of superheroes to capture Loki and retrieve the device. 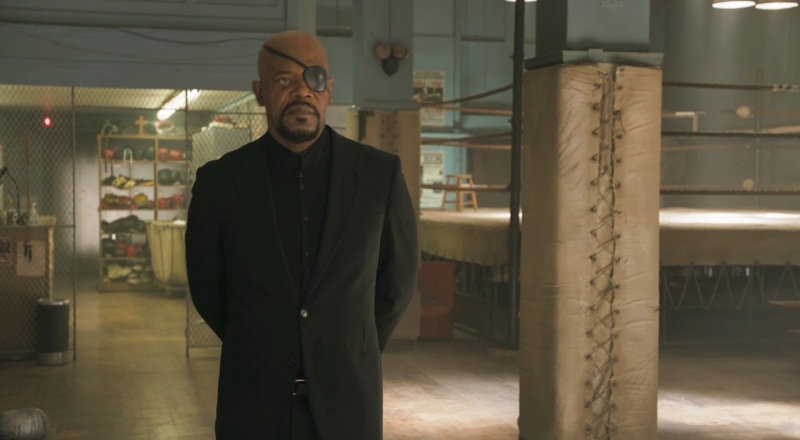 Fury has wanted this mash-up almost as long as the fans have, even giving the project a name: The Avengers Initiative. But, getting them together will be no small task. Captain America (Chris Evans,Fantastic Four) has been recently discovered and thawed, Iron Man (Robert Downey Jr, Sherlock Holmes) is finishing Stark Tower, Thor (Chris Hemsworth,Star Trek) is stuck on Asgard, and David Banner/Hulk (Mark Ruffalo, Shutter Island) is playing doctor in Calcutta. As our heroes assemble (no pun), we soon realize that some team building will be necessary, only the 'activities' involve a lot of fighting and trading quips with one another. 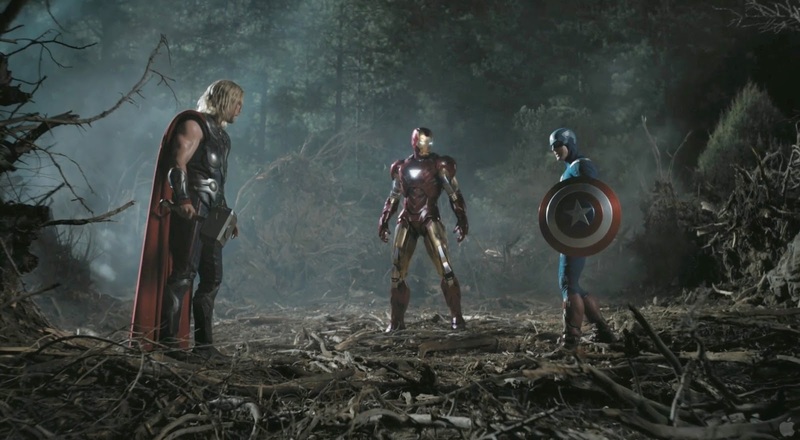 These hero fights are the best from the franchise and take place in unlikely locations, such as the epic forest battle between Thor and Iron Man. Our heroes eventually join forces with SHIELD agents Black Widow (Scarlett Johannson, The Spirit) and Hawkeye (Jeremy Renner, MI:IV), defending New York City when it falls prey to Loki and the Chitauri, a race commanded by an unseen force in another part of the universe. As the invasion begins, The Avengers race against the clock, using every ounce of their strength and the new-found teamwork to defend the people of Earth. 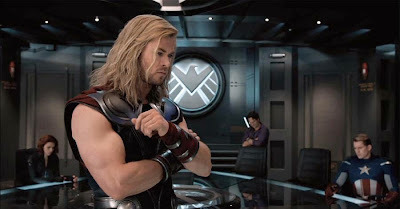 The Avengers delivers in every way, hitting each mark with a perfect mix of humor, action, and story. Whedon definitely understands every aspect of these characters, and crafts a story that is as funny as it is action-packed. The quibbling between Iron Man and Captain America is terrific, as it is between Thor and The Hulk. When Loki invades Stark Tower, he and Iron Man engage in a verbal sparring match that's extremely gratifying. But there's also a serious tone to the film, as Cap struggles to deal with the rapid changes in his life, and the realization by Black Widow and Hawkeye that their training never prepared them for this line of work. Loki's character is much more diabolical this go-around, as if his fall into the abyss in Thor resulted in serious mental damage to his psyche. But it is The Hulk who steals almost every scene in which he appears, including one with Loki which is an instant classic. There are so many layers to Whedon's story that one would have to see the film a couple of times (probably the point) to catch everything. Another standout feature here are the four large action pieces, each one achieving a higher level of perfection than the latter. The scale of the battles is simply amazing, with every character getting their fair share to demonstrate their incredible powers, and sometimes using each other's weapons in tandem (think about the video game Ultimate Avengers). Even the music by Composer Alan Silvestri (The Quick and the Dead) stands proud and tall, a fact which cannot be said for most of his projects. When our heroes assemble in a 360 degree money shot near the end of the film, Silvestri hits us with a theme that will knock your socks off, reappearing throughout the film to remind you just how cool it is. The 2 hour, 22-minute epic doesn't feel long at all, passing by with a speed only Iron Man seems capable of achieving. The Avengers embodies all the best qualities of the franchise, perfectly weaving aspects of the Marvel film universe into a tale that redefines the genre forever, upping the ante in every scene and then paying it off with terrific wit, style, and heart. Two post-credits scenes are presented, so make sure you stick around for them. The Avengers sends a strong message to the DC universe and the summer film lineup in general: bring your 'A' game, or risk a Hulk smash! Just got back. The entire time I watched the movie I had a smile on my face and I couldnt wait to come home and talk about it on this site. This website is the equivalent of the avengers movie in my mind. Epic and you have to keep coming back to catch all the amazingness.....now do a giveaway with hulk cap thor and iron man all together! Contest away the big 4!!!! I loved the movie. Love the site. U guys rock. The movie was awesome all around, I just wish there had been more Hawkeye. Jeremy Renner was fantastic and I was a little bummed there wasn't much more of him. Hawkeye Rocks!!!!! Oh... and Black Widow.....I want to be on her!!!!! I have seen it 5 times, going for 6!! You can't watch it too much, it's just that good! All of them work together so well even when they are not getting along. Also it's Bruce Banner, not David Banner like it said in the review.